If there is a fashion classic that is worn by both, women and men, and never really gets out of fashion, than it would be the striped shirt. 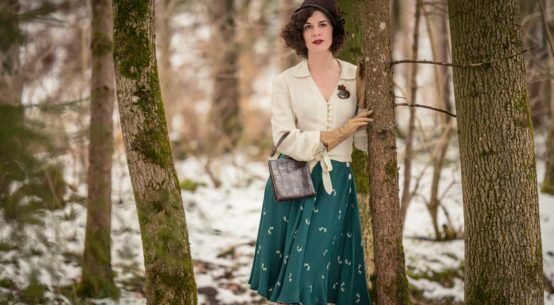 But how does the former prisoner’s clothing became such a fashion classic? And how can the striped shirt be teamed for different occasions? I’m going to answer all these and even more questions in the following blogpost. It is said, the striped shirt has its roots in the maritime style. This is partly true, but if you have a deeper look, you will figure out that the story of striped clothes is much older and definitely more spectacular. In medieval times, striped clothes mainly were for social outsiders. It even doesn’t matter if the characters were real or imaginary. In medieval art, stripes frequently are a marker of rebelliousness, treachery, and cruelty. Stripes marked the criminal, crippeled, and insane, but also those with dishonourable trades, such as prostitutes, butchers, hangmen, or people with professions like minstrels or clowns. Striped clothes were and sometimes still are also associated with prisoners. Sadly fame gained the blue and white vertical stripes of the clothes worn by the inmates of concentration camps during the NS time. As those stripes helped the former inmates to get back to their home countries after liberation, some SS members tried to escape from their punishment by wearing those striped clothes. In the 17th century, the image of striped clothes changed. Nevertheless, stripes usually were still associated with the social lower class and beside slaves, were also worn by butlers, waiters and chambermaids. So they were a kind of marking for the servants. But how did the striped shirt became such a fashionable piece and even made its way into Haute-Couture? To understand this, we should have a deeper look at the maritime style. It is said that it is easier to find sailors that went overboard when they wear stripes. So seamen started to wear stripes, also the fishers from Bretagne (Brittany), hence the shirt with blue and white stripes is also called breton shirt, sometimes. In the beginning, the seamen wore all different kind of stripes. To tidy up the stripes chaos, in 1848 the exact look of the outfit of the French Navy sailors was defined. The striped shirt “the marinère” was worn as a vest and had to have exactly 21 white stripes. It is said that with this, they want to remember the 21 victories of Napoleon. But this is maybe only a legend. So all in all it can be said that for a very long time, stripes were the mark of socially lower classes. The striped shirt stands for the ordinary seaman, not for the officer. But then, in the 20th century, it became fashionable to spend the vacation at the sea. And this is how the striped shirt found its way to Coco Chanel and therefore also into fashion. As many others, Mademoiselle Chanel loved to spend her vacations at the sea, in Deauville, France, to be precise. There, she fell in love with the striped shirts of the fishers and wore it by herself in combination with wide trousers as well as a beret. It seams like this style has really inspired her, as in 1913, she showed a striped silk shirt in her collection. Since then, the striped shirt not only captured the runway, but also got a kind of symbol for the French chic. The “Breton Shirt” was and still is worn by artist, bohemians, and intellectuals. No matter if Picasso, James Dean, Marilyn Monroe, Brigitte Bardot, Audrey Hepburn, Madonna, Kurt Cobain, or Duchess Kate, they all showed themselves in the striped shirt. The striped shirt is also the signature feature of Jean Paul Gaultier. 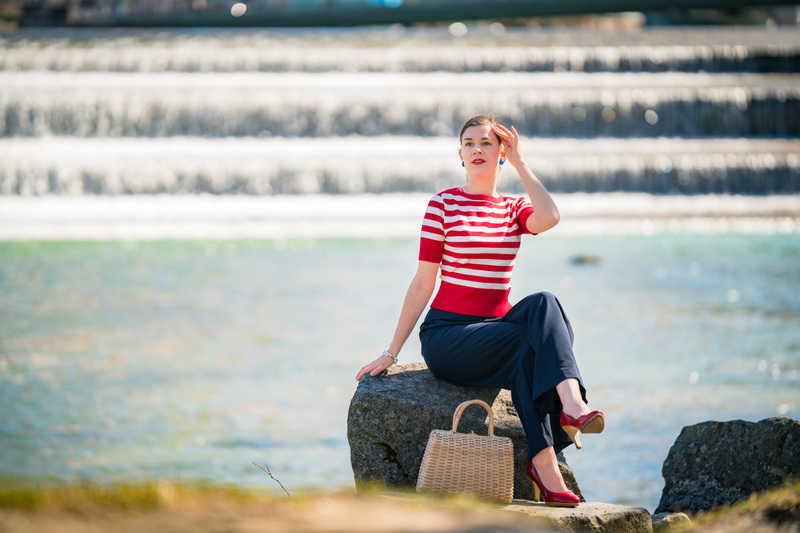 In the 1950s, the nautical style came back into fashion and was especially popular in casual wear for adults. The cheeky girls of the 50s teamed the striped shirt with shorts (which, by the way, looks still great ;-)). Since then, the nautical style has never been really out of fashion. Nowadays, it is available in many different colours, stiles, and variations. Stripes are really able to enhance ones figure and cover ones alleged problem areas. In the following, I’m going to introduce the different kinds of stripes and tell you, how to wear them. Horizontal stripes are often considered as not very flattering, but this doesn’t have to be true. However, you can say that the broader and more prominent the stripes are, the more they seam to optically shorten and broaden ones shape. So very prominent and broad stripes look best on people with a long and slim upper body. People with a rounder or H-bodyshape rather choose smaller stripes or try vertical stripes. Vertical stripes optically stretch ones body and are therefore perfect for smaller people or people with an apple body type. People with bandy legs or knock knees, though, rather choose vertical stripes on their tops and not trousers, as those can even enhance this shape. Diagonal stripes can look really interesting and fancy. If they have a V-shape, they optically broaden the shoulders and are therefore perfect for women with a pear body type with broader hips and slim shoulders. If the stripes have an A-shape, on the other side, they make your shoulders look smaller and look best on people with an apple body type. To create an hourglass silhouette, a combination of both is best: a V-shape on the upper part, and an A-shape on the lower part, merging at the waist. What makes the striped shirt such an amazing fashion-piece is that it is so versatile and super easy to team. Stripes make every look a bit more relaxed, but still stylish and can even look very chic. In the following, I’m going to show you striped shirts in different variations and combination, featuring everything from casual to elegant. The base of this look is super simple: a striped shirt and the Thelma Skirt by The Seamstress of Bloomsbury* – everything in black and white. My pumps take up these (non-)colours, but are also a great contrast as they have vichy checks. 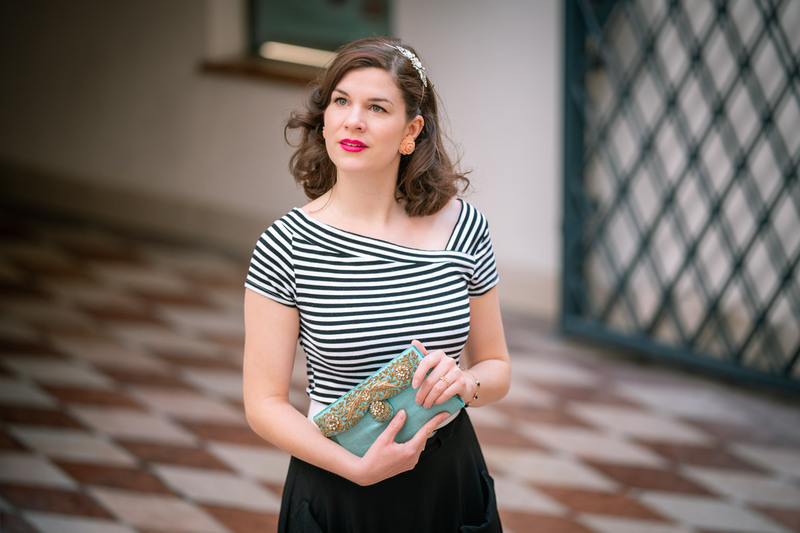 Some colourful details like my pink lipstick, light pink earrings, as well as a gorgeous vintage handbag in baby blue make the look more fashionable and interesting. My sparkly hairband literally is the crowning of this outfit and finishes the look perfectly. Of course the classic – a blue and white breton shirt – shouldn’t be missing in this blogpost. 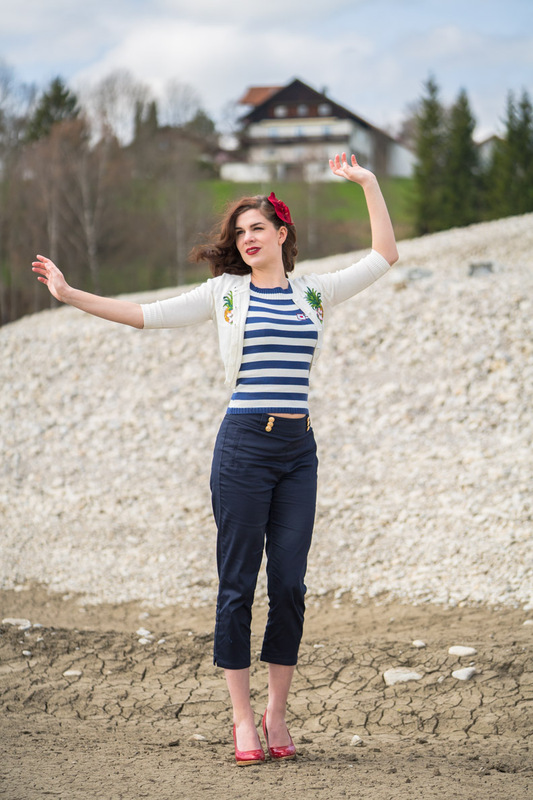 In combination with capri trousers as well as red accessories, it is simply perfect for a walk at the lake or sea, a trip to the ice cream parlour, or a picnic at the beach. A striped shirt doesn’t have to be blue and white to look nautical. A red and white version together with navy blue trousers and red pumps looks quite maritime as well. With long trousers, the outfit looks immediately more dressed an a bit more elegant than the version showed before. This is also a perfect look for some cooler spring or summer days. A striped shirt doesn’t require a lot of accessories to look great and stylish, as this look proves. This summery light outfit only consists of a red swing skirt, a shirt, a waist belt and some accessories like a handbag, sunnies, and wedges. Perfect for an evening at the sea or a casual dinner. Stripes not always have to look nautical. In combination with a red pencil skirt, stripes can even look quite seductive and extraordinary. I even colour-matched all my accessories. A perfect look for the office, if the dresscode is not to formal, or a coffee date with friends. As mentioned before, stripes were quite popular in the 1950s. 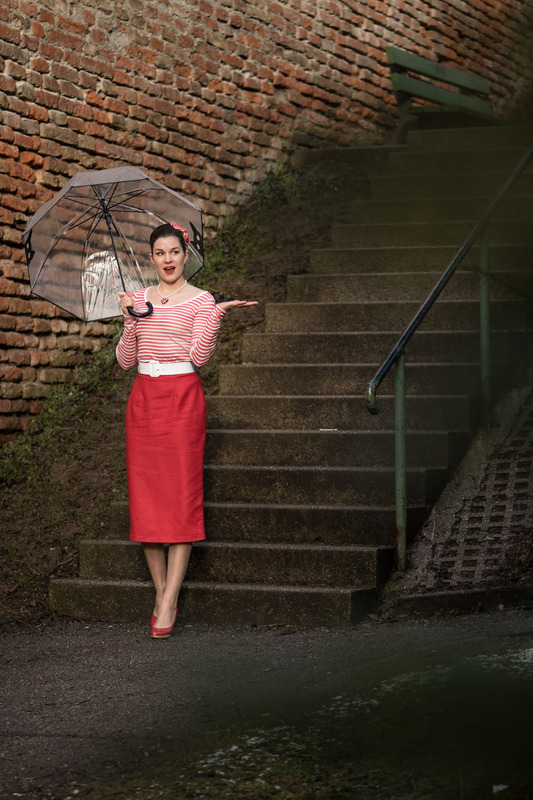 For an authentic look, I team the shirt with a flared midi-length skirt and a petticoat. 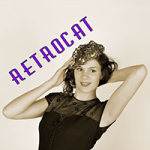 Accessories like my vintage handbag, a hairflower, and wedges finish this retro outfit. This is one of my favourite holiday looks, by the way. Stripes can even look glamorous! 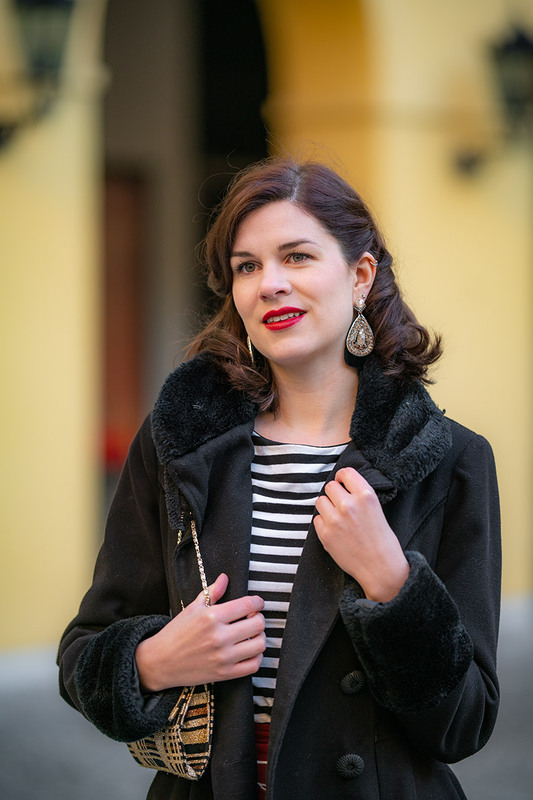 I team the black and white stripes with an elegant coat, sparkly earrings, a pretty handbag, as well as a matching skirt. Some curls and red lipstick and the glam look is finished! The perfect outfit for every occasion that is not formal, but requires more than very casual clothes. And now, I’m curious: What about you? Do you like stripes as much as I do? And how do you wear them?